In today’s technological age it is no big secret that guest blogging is very important. There are in fact innumerable pros of guest blogging which include building relationships, gaining visibility, helping you building better partnerships as well as gain immense exposure. Enlisted is a comprehensive and detailed list that is everything you need to know when it comes to advanced guest blogging. There is some truth in the common saying that success comes to those who wait for it, however advanced guest blogging is not an area where sitting around is going to get you anywhere. You constantly have to be on your toes, vigilant as well as on the lookout for any famous and renounced company where it would benefit you to submit a piece of your work to them. To find out such top companies all you need to do is do a Google Search and there will be numerous options to choose from. Most often than not, popular blogs make it a point to make themselves visible on various social media sites as well. These sites include Facebook, Twitter or even Instagram. Make it a point to ensure that the site has a relevant social media presence. However sometimes there are numerous credible blogs that have an aversion to social media sites and prefer to have nothing to do with them. So you must be careful when it comes to coming to your conclusion. Before you think of submitting your work to any blog it would greatly benefit you take out some time from your busy schedule to have a look at some of the blogs previous guest’s posts so as to get some sort of idea as to what kind of people usually send in their submissions. If you find that there are several substandard and badly written posts then you know that this is not the kind of site you would like to have associated with your name under any circumstances. 4. Does the blog only publish posts by guests? It is very likely that those blogs which only most guest posts are not entirely legitimate. As most legitimate blogs will most certainly make it a point to post some content of their own and not depend completely on guest posts. Though this advice does hold true in most cases, however, there are some exceptions to this as well. Based on the blog then you should make it a point to use your own discretion because at the end of the day only you can tell what is best for you and your career. This is a very important thing you should consider when guest blogging No matter how popular a blog is if their target audience is entirely different from your own then it is unlikely that your posts are doing to get the recognition that they deserve. If the general target audience of the page is senior citizens but your articles are pertaining to health tips, fashion advice or outdoor adventure ideas for the young then it is obvious that this is certainly not the site for you. Blogs that are updated regularly are certainly the good and active kind, however you must ensure that though the blog is updated regularly they post proper well-written articles and do not post things just for the sake of it so as to keep themselves relevant in the virtual world. This is a rather cheap marketing gimmick which you should keep yourself away from. Blogs that are willing to post anything no matter how substandard are usually inferior quality blogs which are certainly not worth your while. You should ensure that the guidelines and regulations for all the guest bloggers are extremely strict so that you get an idea that only quality work is selected to be published on the blogs and that shoddy work or grammatical errors will not be selected under any circumstances. This is surely the mark of a good and reputed blog. One of the best ways to get an idea of the kind of community the blog has is simply by viewing the comments that have been posted by various individuals. If you find that it is a community of decent and educated individuals who give proper praise when it is due as well as constructive criticism when needs be, then you know that this is a good blog which attracts the right kind of people. After all, you wouldn’t want your name becoming famous among the wrong crowd. Most often than not, those sites which have no contact information are not legitimate and reliable ones. You should not give a guest blog submission to a blog like this one where there is no sort of accountability. If you are guest blogging then obviously you should try and be a part of the best blogs that are not merely popular but also legitimate. Once your submission is posted then to some extent your name to gets associated with that blog. It would serve as a great platform for you if the sites that you do guest blogging for are both reliable, popular and with a number of loyal subscribers. There is absolutely no point blogging for a site which gets no comments, likes or shares because after all when you blog you would like your work to get as much visibility as possible and reach out to a number of people across the virtual world. There are some blogs that take forever to post the submissions of guest bloggers on to their sites. Such blogs are certainly those which you should try and avoid, because most often than not bloggers tend to write stuff which they want to be published immediately, when the matter is posted at a later period, chances are that topic will not be relevant at that later time and you too might not be able to appreciate or connect to the comments that people leave. A potent question that you need to ask yourself when you become a guest blogger for a site is whether or not you would be interested in blogging regularly. Sites prefer to post the writing of those individuals who will be able to contribute regularly so that they do not have to constantly keep hiring new people to send in their submissions to them. It is not mandatory that you contribute regularly but it would be nice if you could so that you get a lot of visibility. 13. Is the content of the blog in consonance with your style of writing? This is another important question you ought to ask yourself when choosing to do guest blogging. It is not so much that your matter has to be exactly same as the posts otherwise published on the page however you should make it a point to ensure that the mood and temper of your writing fit the general mood of the site. For example, if you prefer to write serious pieces on topical issues it would be wise of you to avoid a light hearted fun site so your work does not stand out like a sore thumb. Many people guest blog simply for the sake of it. However, most others do it because it helps a great deal in building contacts as well as forging relationships. It allows you to get acquainted with other blogs that post on issues which are similar to your own. Once you guest blog then you can carve a name for yourself in the niche world and this could help your own blog gain more popularity by attracting those who might have read a submission that was published when you were guest blogging. 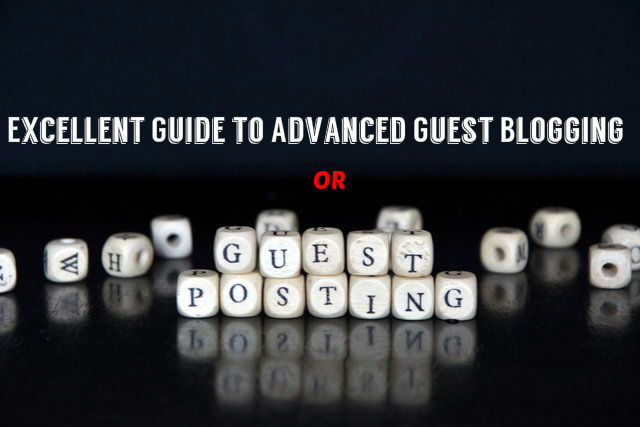 So this is basically everything you need to know about an advanced level of guest blogging and it even includes some potent questions you need to ask yourself, especially if you think that this is something that you might be interesting. At the end of the day, it is needless to say that guest blogging is not merely a want but a necessity if you desire to remain a part of this cut throat twentieth-century technological era where you have to constantly prove your worth at every stage. I really like this article. So much so that I linked to it in my latest guide about guest posts. I hope this is okay! Feel free to let me know if you wanna see it. Anyways. Just giving credit where it’s due.